(Source: Aftenposten, June 7th 2009) Ryanair boss Michael O'Leary has done it again. First he introduced pay-per-visit to on board flight rest rooms. Now he will chuck 2 out of 3 restrooms out of the planes to squeeze in 6 more seats for travelers. And to those of you traveling with Ryanair in the future, his advice is clear. Go to the toilet before boarding and hold your water during flights. The question is, however, whether this mean attitude may provide another nail in the airlines coffin. I certainly hope so! 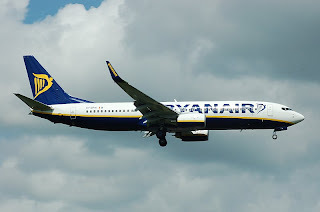 Ryanair has been extraordinarily aggressiv to squeeze costs. Some of the measures proposed by O'Leary is understandable and reasonable, as e.g. to substitute check-in counters with self-service machines. But the airline has also been very inventive to introduce extra (and often high) fees for their travelers, e.g. for checked-in luggage, extra tax-free shopping bags taken on board and pay per visit to in flight toilets. But there are limits to what humiliation an airline may subject paying customers to. Asking their travelers to restrain their bodily functions during flight is way past any such limit. O'Leary points to the fact that the airline operates flight on an average of one hour in Europe. What he forgets though, is that one hour may easily become two or more, including the time needed for boarding and taxing. Denying the public access to only one restroom during flight is highly irresponsible. What if several of their guests turned ill during flights? Their suffering and the inconvenience to fellow travelers on such a "hold-your-water-flight" would certainly make many think again before booking another flight with Europe's meanest airline. So Michael O'Leary is adviced to come to his senses. If not, travelers will turn their back to Ryanair. I have! I have found that the airline is not that cheap, anyway, compared to other air carriers, when you include all of O'Leary's clever fees.